Grandma’s Hands | Sustainable Shanti Is Now Em & El Organics! Wow! What a busy holiday season we’ve had here! I’ve been spending a lot of time in the kitchen lately, getting orders ready for holiday presents to put Sustainable Shanti goodness under trees and in stockings all across the world. It occurs to me, as I measure and melt, watch and tend to all of the little details of each recipe and each batch of products how much it reminds me of my childhood. My mom’s mom, Lillian Young, used to make 5,000 cookies every Christmas and she was unsurprisingly quite famous for it. She didn’t make just the standard chocolate chip and oatmeal raisin, though they were always included in her selection. She made treats like pecan tassies, gooey butter, chocolate macaroons, snickerdoodles and sugar cookies, each individually wrapped and counted by my grandpa who was coerced into playing helper. Her cookbooks are crammed with her lists of what she made, her recipe changes, and a record of everyone’s favorites. They are an incredible story of her holiday seasons through the decades. As a child, I spent a great deal of time growing up with my grandma, learning to bake perfect pies, cookies, strudel, cakes, and frosting, always in awe of the transformative powers of an oven. My grandpa countered these kitchen adventures with equally exciting adventures in his woodworking shop and crawling under cars. These days, my time spent in the kitchen is a little different than those cookie days. However, I find myself making my products using the same industrial Pyrex measuring cups and bowls which I inherited from my grandma. When I stop to wash a dish, I think of how many times her hands touched these same tools and how fortunate I am to be able to use them for my business, something of which I know Grandma would have been unspeakably proud. 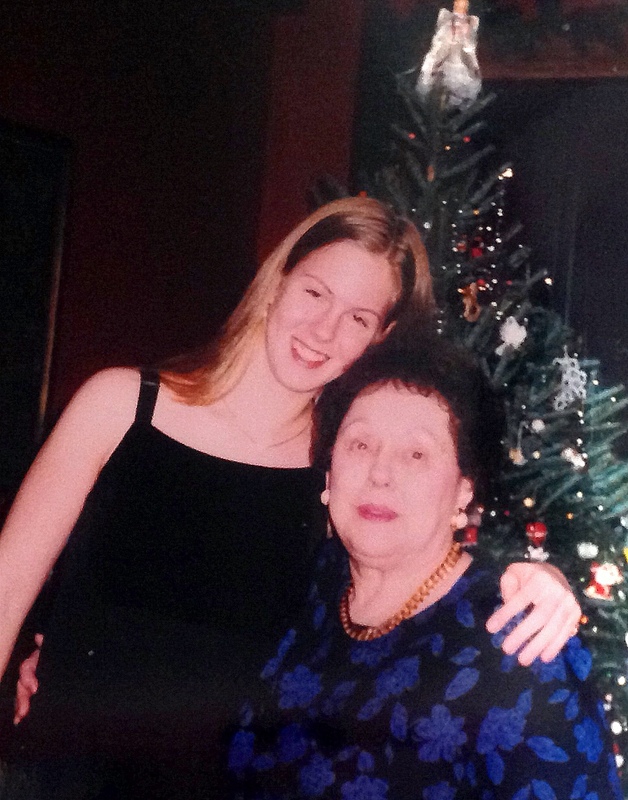 Holidays for me are hard for me without my grandma by my side, but I know that she is watching me from afar. Through time and space, her hands are moving with mine as they did when I was little and still learning how to perfect a pie crust or shape a new cookie. In this season of holiday shopping madness, where commercials tell us to buy bigger, shinier new cars and more powerful power tools in our quest for happiness and “the best Christmas EVER!”, let’s remember what really matters: the people in our lives who remind us how to live, how to laugh and show us the true joys of life. Be grateful these people who love you, and thank your lucky stars for the opportunity to love them. May your days be bright, and now, more than ever, be well, do good, and share the love. This entry was posted in Uncategorized and tagged Chocolate Chip Cookies, Christmas, Cookie making, Cookie recipes, Inherited traditions, Oatmeal Raisin, Pyrex, Sustainable Shanti by sustainableshanti. Bookmark the permalink. What wonderful memories! Both your grandparents loved you very much and would be so proud of you now.